Chinese tech giant Xiaomi has partnered with Amazon for Redmi 4A launch in India. The smartphone could be the best of Xiaomi Redmi series for its price tag of Rs 5,999 in India. Xiaomi’s 4A Flash sale is going to commence from 12 Noon today on Amazon.in and mi.com. The design and specs sheet of the device are decent with an impressive performance in its range. Now, the company has come up with another bundled data offer by Idea Cellular. This Xiaomi Redmi 4A launch offer provides a great combo of data with the phone. Idea users will get 28GB of 4G data with the recharge pack of Rs. 343 if they buy Xiaomi Redmi 4A from Amazon India. The daily limit on the data consumption will be 1GB. Besides this, Redmi 4A customers will get 300 free minutes per day and 3,000 local and STD SMS’s per month. This recharge pack is valid for 28 days, and after that, users can avail same benefits with the same recharge worth Rs 343. The offer expires on June 30, 2017. New Idea customers who buy Xiaomi Redmi 4A should do the first recharge as per their respective circle. Then, the prepaid recharge of Rs. 343 brings the benefit to new users. Amazon introductory offers on Xiaomi 4A include 10% cashback on Induslnd credit and debit cards. In Addition to that, the e commerce platform is also providing Rs 200 as an promotional offer credit for Kindle books. Users can also get the Mi in-ear earphones for Rs 599 and Mi case cover for the Redmi 4A and Rs 349. 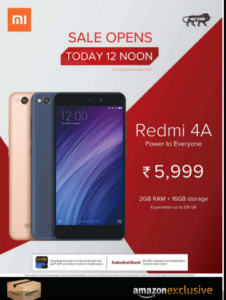 These offers are valid for buyers who are purchasing Redmi 4A smartphone from Amazon India only. Coming to the specs, Xiaomi Redmi 4A features a 5-inch HD IPS Touchscreen Display. The device is powered by Quad-Core Snapdragon 425 Processor coupled with 2GB RAM With 16GB ROM. On camera font, Redmi 4A sports 13MP rear Camera with Dual-Tone LED Flash and 5MP Front Camera. Other Connectivity options in the device include Bluetooth 4.1, Wi-fi 802.11 b / g / n 4G and 4G internet connectivity. The entire unit of Xiaomi Redmi 4A is backed by a 3120mAh Battery.